The IMF thinks cuts have damaged growth more than previously thought, reports Will Straw. Headlines have today focused on the IMF’s downgrading of the UK economy. But a more significant development is buried in the small print and shows the IMF thinks cuts have damaged growth more than previously thought. The multipliers used in generating growth forecasts have been systematically too low since the start of the Great Recession, by 0.4 to 1.2, depending on the forecast source and the specifics of the estimation approach. Informal evidence suggests that the multipliers implicitly used to generate these forecasts are about 0.5. So actual multipliers may be higher, in the range of 0.9 to 1.7. In other words, a cut to government spending or tax increase affects growth by two to three times more than expected. Significantly, the accompanying graph (see right) shows the UK sits squarely on the downward sloping line. This means Britain’s performance is entirely consistent with the IMF’s model showing an error in estimates of multipliers. The Office of Budget Responsibility published their own estimates of fiscal multipliers in June 2010 (pdf). As shown below, they suggest multipliers were in the range 0.35 for tax cuts to 1.0 for capital expenditure. The IMF’s revelations suggest these were underestimates. The reason for the UK’s dismal growth performance in recent years can be explained by the decisions around spending cuts. The government’s 2010 spending review (pdf) showed capital expenditure would be cut by 29 per cent over four years compared to an 8.3 per cent cut in current spending (Tables 1 and 2). The former, which was also planned by the Labour government, can now be seen as a catastrophic mistake which has done more to dampen growth than any other measure. “If growth should fall significantly below current projections, countries with room for manoeuvre should smooth their planned adjustment over 2013 and beyond,” the fund said, adding that they included the UK. Using the government’s balance sheet to ramp up investment, including by immediately capitalising the Green Investment Bank, should be top of the chancellor’s list. The big problem you fail to realise is that taking money off people and spending it on welfare doesn’t produce jobs. Borrowing money for welfare is even worse. You have to pay it back with interest, and that interest isn’t producing growth, its cutting growth. As for debt, you still have your heads up where the sun doesn’t shine. Where is the state pension as a debt? 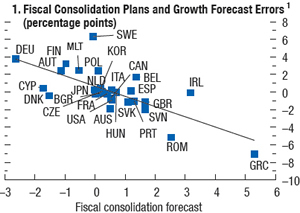 On the graph front, you are missing the graph that shows low taxes are correlated with high growth. Again, the balance sheet is a fraud. Why should the state pension, civil service pension be off balance sheet unless you have no intention of paying them? Time to put politics above accountancy and the creative back in the politics and not the accountancy.Time to invest now to borrow less in the future.Time to get rid of off balance finance-that’s what caused the problems.It certainly hasn’t fooled the IMF.Time tobe open too. refuse to consider known debts because you will refuse to pay them. The graph which dosn’t exist, Lord Blagger, outside the one you drew from your imagination? Where are the DOI’s for your studies. It don’t, I see, the concept of education doesn’t create jobs, kids! And of course your bungling, which is raising the welfare bill, is doing that. So what happened to all that investment under Brown? Time to reap the rewards of less spending, isn’t it?